Medill’s newest campus presence is in the heart of the Bay Area. Northwestern’s San Francisco campus is located at 44 Montgomery St., right in the city’s Financial District. It opened in fall 2016 and is a partnership between both Medill and Northwestern’s McCormick School of Engineering and Applied Science. The integration of both schools further fosters the connections that engineering and computer science share with journalism and Integrated Marketing Communications. As Medill’s first location on the West Coast, the San Francisco campus opens the school to a wealth of alumni and partners located in the Bay Area, and the curriculum has been designed to reflect and integrate those connections. Being in the heart of the start-up industry makes the San Francisco campus a great space to develop new and innovative ideas. At the San Francisco location, students participate in short-term classes, quarter-long residencies, short immersion experiences, and alumni and partner events. Topics of these programs include technology, innovation, digital media, human-centered design and more. 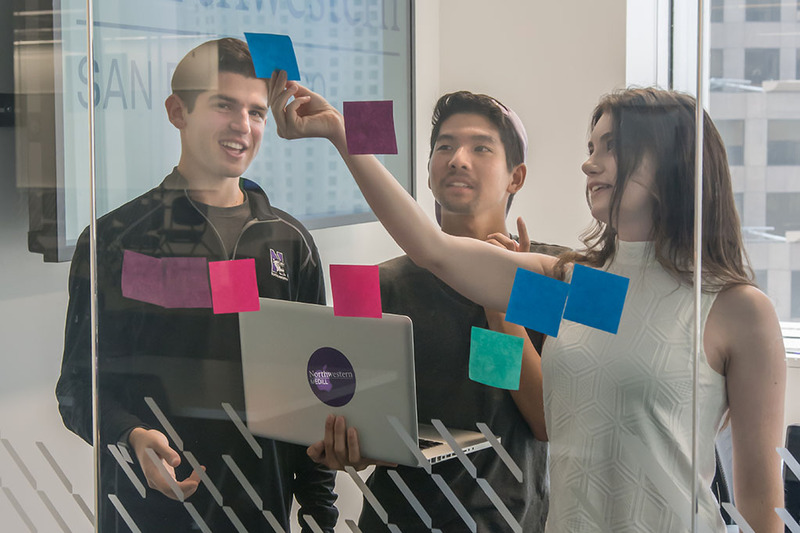 Northwestern’s San Francisco space features a state-of-the-art presentation area to encourage alumni and partner engagement and formal conversations, collaborative classrooms and a flexible design studio.